Despite my penchant for British literature, I must admit that this was my first foray into Amis. A complicated person in his own life, he seems to have attempted to shed some of his anxieties on his characters. Indeed, the title character James Dixon is dissatisfied professor of medievalism. He was surely drawing on some of his own teachers while at Oxford, no doubt sometimes unhappy in their own situation. Despite this, the reader finds James Dixon trying to meet the requirements to survive his trial year and achieve tenure at the regional and unacclaimed university. He must navigate the elite company he finds himself among, including a vapid boss and an emotionally irresponsible squeeze, all the while searching out the nearest place to get a few pints. Amis’ writing has been compared to Wodehouse and Waugh, but that doesn’t quite describe it. Lucky Jim is denser and less accessible than Wodehouse. Amis’ characters are darker and disturbed. And Waugh had a eviscerating tone that accompanied his angsty young people. Here Amis finds humor in middle aged pretension. And it often is uncomfortably funny. There is a certain defeatism, a begrudging acceptance, that life doesn’t always turn out as one planned. And even if it had, it’s not at all what your youth had imagined it. ‘What work do you do?’ Dixon asked flatly. 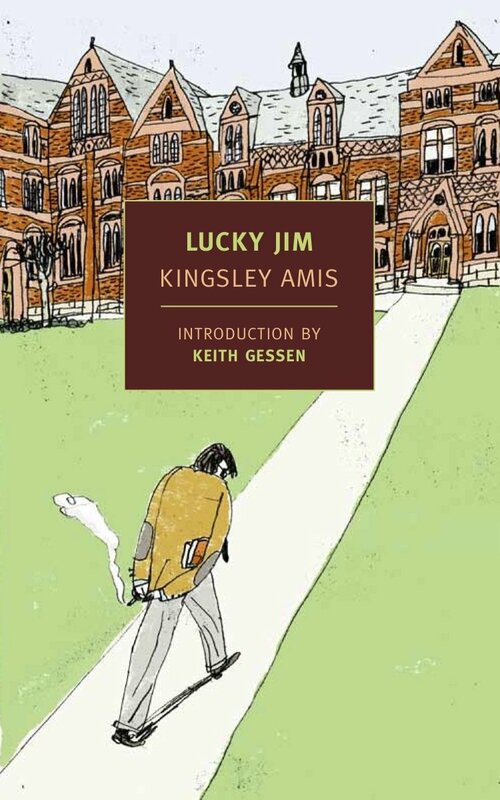 Lucky Jim is amusing for those who enjoy dark humor with a healthy dose of absurd realism. Many thanks to the folks at New York Review of Books for the review copy.